180 years ago, on Apr 29, 1836, the infant Society of Mary received official approbation from the Church through a letter from Pope Gregory XVI. The mission-minded Pope and the Congregation 'Propaganda Fide' were looking for missionaries to send to the distant and unevangelised south-west Pacific. 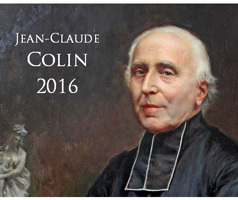 Marist Founder, Jean-Claude Colin, responded: 'We will go to whatever distant shore... '. 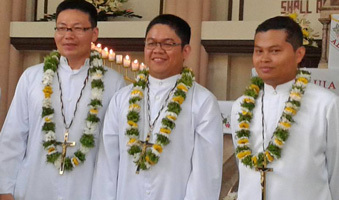 In a ceremony at Davao, Mindanao, southern Philippines, on Apr 28 three young members of the Marist Asia Mission District made their final profession as Marist religious. Pictured, left, they are John Guo, Nino Memorial and Roque Rebito. Congratulations to each of them! They will each soon be ordained deacons on their way to priestly ordination..
On the Pacific island of Futuna on Apr 28, 1841, pioneer Marist missionary, Fr Peter Chanel SM, was bludgeoned to death. This year Marists across the world honour their first Saint on this 175th anniversary. For commemorative bookmarks click here. Print on light cardboard, or laminate. The Feast of Marist protomartyr of the Pacific, St Peter Chanel, Apr 28, has been chosen as the launch date for the updated Oceania Marist Province web site, www.maristoceania.org. 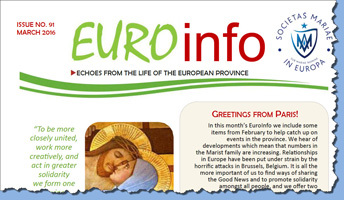 The new site will include regular provincial bulletins, news of happenings in the province as well as historical summaries of its various regions and information on Marist vocations and formation. Click here for background to the redevelopment of the site. Updating will continue in coming weeks. 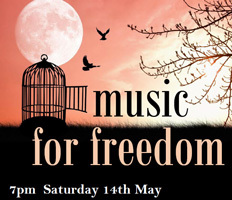 ACRATH (Australian Catholic Religious Against Trafficking in Humans) announces 'Music for Freedom', on May 14, at Del Monte school hall, Strathfield, NSW. The fund-raising event will be compered by tghe ABC's John Cleary. 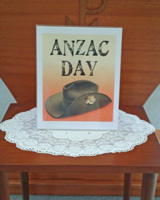 Not really news... just the Marist Sisters at Woolwich, NSW, simply remembering our fallen. 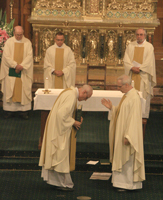 New pastor of St Patrick's, Church Hill, Sydney, Fr Michael Whelan SM, was liturgically installed as parish priest on Apr 24 by vicar-general of the archdiocese, Rev Dr Gerald Gleeson. 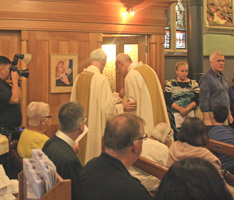 A packed church witnessed the ceremony which included special prayers at each of the sacramental places within the church, including the confessional for which the inner-city church is well known and appreciated. 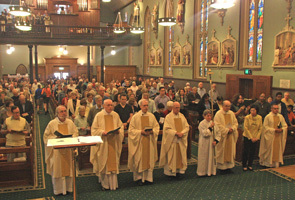 Above: Marist confrères and a large congregation were present for Fr Michael Whelan's installation Mass. | Fr Gleeson accompanes Fr Michael at St Patrick's confessional / ... and baptismal font. Below: Fr Michael with vicar-general, Fr Gerald Gleeson / .. and friends | Celebration in the crypt of St Patrick's. Latest circular letter of Superior-General, Fr John Hannan SM, to Marists. 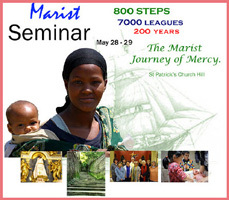 Early-bird bookings are available for Marist Laity Australia's weekend seminar on May 28-29 at St Patrick's, Church Hill. As a prelude to the Bicentenary of the Fourvière Pledge of 1816, 'The Marist Journey of Mercy' will feature input from Fr Michael Whelan SM as well as a pilgrimage to important Marist sites. Further development of the web site of Pacific Climate Watch shows an increase in supporting groups and congregations, as well news articles and responses. 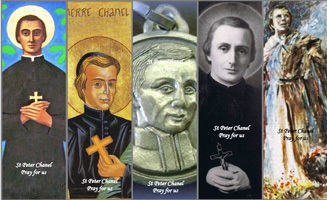 The customary Novena for Vocations through the intercession of St Peter Chanel begins on Apr 19. The Marist saint's feast day is Apr 28, this year marking 175 years since his martyrdom on the Pacific island of Futuna in 1841. From the Marist Mission at Ranong, southern Thailand, Fr Frank Bird reports 'a fantastic year' as he presents the Annual Report for the Marist Asia Foundation. Led by Filipino Marist, Fr Kevin Medilo, the Ranong team cares for a varied community of Burmese migrant workers and their families. 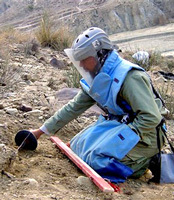 Click here for the Marist Asia Foundation report. 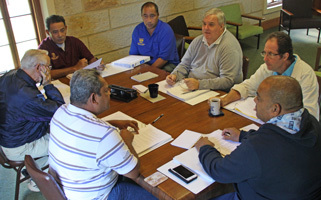 Oceania Marist Province's Finance Committee gathered for its annual meeting this week at Villa Maria monastery, Hunters Hill, original base for Marist operations in the Pacific. Provincial, Fr Ben McKenna SM, also attended the meeting which reviews and reports on financial matters throughout the vast, multi-region province. Above, clockwise from bottom right: Fr Setefano Mataele (chairman), Mr Lawrence Cakau (provincial accountant), Frs Kevin McGuire (secretary), Lutoviko Manu, Patolo Matiasi, Brian Wilson (mission procurator) and Ben McKenna (provincial) / The committee meeting in one of Villa Maria's historic, sandstone-walled rooms. 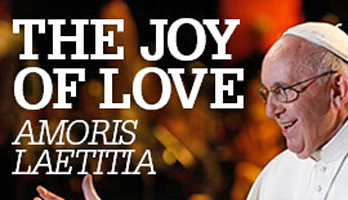 'The Joy of Love', full text of Pope Francis' Post-Synodal Apostolic Exhortation. 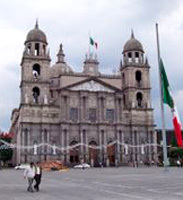 Congratulations to the Marist Province of Mexico and to its newest priest, Fr David Sanchez, ordained in Toluca, Mexico, on Apr 09. 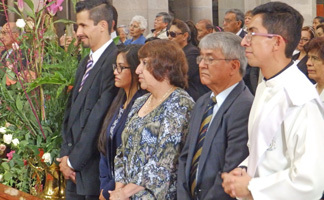 Above: The young deacon lies prostrate while the Litany of the Saints is sung during the ordination ceremony at Toluca Cathedral, Mexico. Below: Scenes from the Apr 09 ceremony. Fr David had recently returned from studies in Rome as a member of the newly-established International Theologate of the Society of Mary, 'Casa di Maria'. Congratulations, Fr David! 'Friends of the Earth Australia' announce important speaking events in Queensland, New South Wales and Victoria in coming weeks. 'We're on the move - are you?' 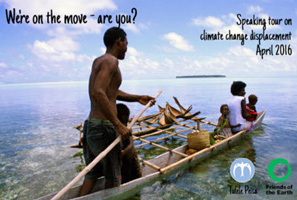 features key speakers from the Pacific's low lying atolls and the implications for climate justice in an Australian context. 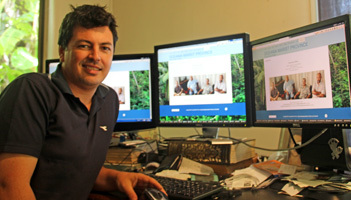 Work has commenced on upgrading the web site of the Marist Oceania Province. Above: Home page images to be used on the new web site. Below, left: Web developer, Justin Lynch, at his West Chermside, Brisbane, office of 'Netvantage' | Frs Tony Kennedy (Marist College, Suva) and Ben McKenna (Oceania Marist Provincial) who are working on the new site / the newly-developed Marist crest for the Oceania Province. 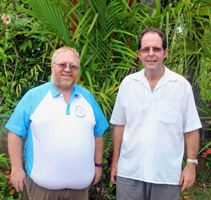 Two members of the Oceania Marist Province have moved from 'Oceania House', Hunters Hill, to other communities in the surrounding Marist precinct. 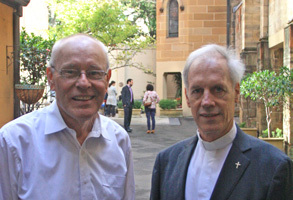 Fr Brian Wilson has joined with the 'Villa Maria' community and Br Peter Somers the 'Maryvale-Montbel' community. 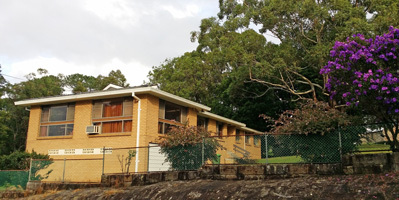 For over forty years the Rocher Ave residence has been a house of hospitality for visiting Pacific Marists as well as a base for the Island province's business interests in Australia. 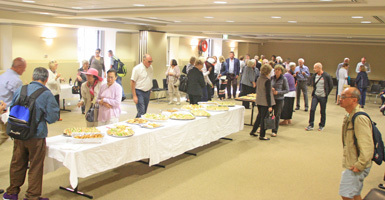 Nearby 'Villa Maria' will now resume its century-long role as a haven for Marists traveling to and from the Pacific. Future plans for the 'Oceania House' site are under consideration by the Australian and Oceania provinces. Meanwhile, welcome, Fr Brian, welcome, Br Peter! Below: Br Peter and Fr Brian in their new sourroundings. 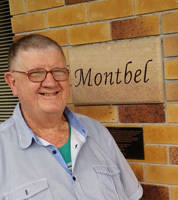 Entering the Society in Australia, Paul was ordained in 1964 and worked in colleges and parishes of the Australian Marist Province for over twenty years before transferring in the 80’s to the Province of Holland, the country of his birth. 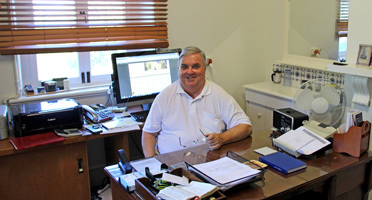 Fr Paul will be sadly missed by many Australian confreres with whom he shared many wonderful years and experiences. May he rest in peace. Once again Australian Marist-author, Fr Paul Glynn SM, is heading for the Auckland Eucharistic Convention in New Zealand. This year Fr Paul will not be giving a presentation as in previous years, undertaking instead to be available for sacramental Reconciliation throughout the whole of the weekend gathering. Over 1,500 are expected at the convention. No, it's not an April Fool's joke... just a glitch in producing the Jean-Claude Colin calendar for 2016. Observant Marists throughout the world may spot the error: Apr 31st included in the calendar, produced in Australia in four languages. Please ignore. The calendar highlights significant Marist anniversaries and is distributed to Marist unit leaders internationally.